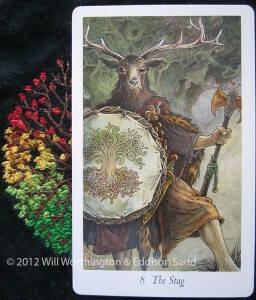 Welcome to my entry for the Tarot Blog Hop on Beltane. Our wrangler this time, Morgan Drake Eckstein, asked us to talk about the distasteful cards. The last Blog Hop, the consensus was, that we needed these in the deck. Hello if you come here normally, or arrived as you’ve skipped forward from Maria’s blog entry. Now, which cards for you (I’m listing just 3 below) cause you to have a negative reaction? Which ones have you hanging your head and wishing for another card, other than the one you’ve turned over? Which ones make you go “eek” when they appear with nicer cards? In The Wildwood, there are a few. To my mind, Justice is always one that makes people go: Oh bums! Or something similar that might be more colourful! In The Wildwood, Justice is The Stag. The protector of the greenwood, holding in his hands a tree of life shield and a double-headed axe. Like the old tales of Herne the Hunter, this being is dressed in animal head and hide, implying that the Justice this Stag gives out, that nature gives out, is long-lasting. Nature can be cruel and devastating, but the idea of “forgiveness and reward” are not applicable to mother nature. Those are human terms and we’re responsible for our actions. The consequences are ours to bear and be aware of. The Justice of Nature reminds us we are but guests upon this Eden. Another distasteful Neighbour that makes folks go: Oh what?! with the Wildwood cards, is The Woodward. I guess, he’d be Strength in the RWS versions, but in truth, The Stag and The Woodward are a combination of them both. This is where the RWS meanings don’t apply to The Wildwood. The Woodward is strong, he symbolises inner power that comes from facing fear, understanding the darkness. He’s the strength we turn to (or find within) in our darkest hour. Unless you’re in Africa, you’re not going to find a lady putting her head into a Lion’s mouth, you are more likely to find a strong person, standing at the back, being the buck that ends it all. That is not done through fear, that is done by acknowledging that there is fear, and using it to their and our, advantage. My third and final offering of distasteful neighbours for this hop, is a Court Card, one that I’ve had an issue with of late, and one I hardly ever pull from the deck or from the app, and that is the King of Vessels, The Heron. Now, whilst they might be gorgeous birds to some, I don’t see it/ I see them as lonely creatures, I’ve never seen a baby Heron, not even on the Wildlife programs I love so much. The Heron might be gifted with psychic perception and reflection, or hold many esoteric secrets, or be the equivalent of The Crow in Celtic mythology, but I really don’t get him in this deck. Is he the distant father, who never gets to see his kids, supports them from afar and loves them regardless? Or is he the quiet uncle that quietly sneaks you another few sweets, after mum has said “no more” ? This is one I’m going to have to get over and create an Oracular Anomaly for. On their own, they’re not so bad, are they, but if you were to get a spread with those three in it, I’d be sat there, for quite a while, and thinking insane thoughts. Even if they come up in a spread, I’d still have to take my time with them in this deck. Lets see what my lovely (and not disgruntled) neighbour & wrangler, Morgan, has to say on the subject. He’s up next! Deck used, The Wildwood by Mssrs Worthington, Ryan and Matthews. I’m a huge fan of the heron but I also see them a lot where I live. A very interesting post. I was surprised to see the K of Cps show up. He’s a fave of mine. Love the differing thoughts! I love this entry, it makes me wonder if I got the topic right but this happens to me all the time so I guess it is all good. Herons are really cool and so is the King of Cups but I do not see how they fit for the same card so I would not like to see it on a reading either. Wow, how freaky! I had no idea Freya was associate with a Heron, until now. But connecting the Heron with Divine, protection and guardianship, is certainly a start! Thanks lovely! Happy to see some different cards here! Interesting perceptions. There is a heron that hunts on the canal in my town, and I feel a very special connection with it. The bird always seems to acknowledge me when we meet, and has even posed for photographs (seriously!) However, just a couple of days ago I saw him, stopped to take a photo, and he immediately flew away. Obviously he was not in the mood to socialise that day… now I know this has no real bearing to your blog post, but I felt compelled to share my tale, and my sense of kinship with the Heron. I do actually feel your discomfort with the other two cards. They seem overbearing and aloof to me, and I feel I would struggle to interpret them in a reading as well.